Description: Stunning bird's eye view of Canterbury from the very first atlas of city and town plans titled "Civitates Orbis Terrarum" [Cities of the World], published by George Braun & Franz Hogenberg between 1572 - 1617. Latin text on verso. Coloured. Description: County map. Allegorical figures. Coloured. Description: Kent. A fine map of the county from the second edition of Speed's seminal atlas, 'The Theatre of Great Britaine'. Vignettes of Canterbury and Rochester. Description: Early county map of Kent with decorative cartouche and compass rose. To the upper right is a list of all its hundreds. Description: Early county map of Kent, based on Norden. Coloured. Description: Dutch Golden Age county map of Kent, with decorative cartouche and Coats of Arms. Original colour. Description: Attractive and rare map of Kent with a large cartouche on the lower left and an elaborate dedication to Heneage Finch. Description: Rare county map derived from Norden and Speed with an inset of Canterbury and dedicated to the Archbishop. Description: County map. Rare, late Dicey edition of the map showing roads and lacking text on reverse. Description: Two sea charts on one sheet. The Thanet District in Kent highlighting the towns of Margate Broadstairs and Ramsgate, another chart showing Blakeney Point in Norfolk. Coloured. Description: Beautiful large scale map of the county in original colour set within panels of historical text. Highlights London and with an inset of The Downs. Spectacularly decorative cartouche, and text descriptions. Original hand colour. Description: County map highlighting the extensive road network in the county and a small vignette of Dover Castle on the lower left. Coloured. Description: A rich and detailed map of Kent taken from Bowen’s landmark survey of Georgian England. View of Canterbury Cathedral and St. Andrews of Rochester. Original colour. Description: Kent. Miniature county map. Coloured. Description: Detailed county map of Kent with subtle original colour. 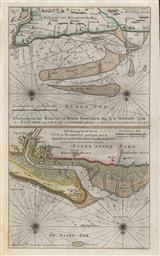 Description: Uncommon map of Kent decorated with a large title cartouche and several sailing ships. Heaths, greens, and parklands are shaded in green. Turnpike roads are coloured yellow. Original hand colour.